The importance of networking while in school cannot be overstated. Often times when a job opening arises, hiring managers will look to those within their network to fill the position. In fact, it is estimated that 80% of positions in the U.S. are filled without any employer advertising. That means if you are relying on job postings alone, you are only seeing 20% of what is available. In spite of this, networking is often under-utilized by business students and professionals alike. Speak with your friends and family – Talk about their work and what you are interested in. This small and simple step could lead to an introduction with someone in the field. Talk to classmates and join student organizations – This is a great way to build and strengthen relationships. Your fellow classmates could be in a position to help you land a job down the road. 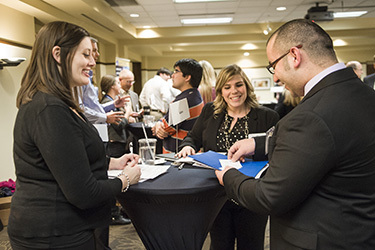 Meet with Raj Soin College of Business faculty and staff – Your professors and advisors have likely been in the business for a long time and can offer a wealth of both information and professional contacts. Attend on campus workshops, info sessions and career events – This is a great way to meet employers face to face and distribute resumes. When employers are looking to hire in the future, they are more likely to reach out to someone they have met before than a stranger. Join professional organizations – Every major has a professional organization that provides networking opportunities, continuing education, and relevant industry news updates to its members. Many times they offer free or reduced rates for students! Take advantage of social media – Stay connected to companies and professionals through sites like LinkedIn and Facebook. Maintaining a professional image, whether in person or on social media, is extremely important. Always dress appropriately when you know you will be meeting and interacting with professionals. The appropriate level of dress may be different depending on what type of event you are attending or who the company is. If you are unsure, ask someone beforehand who may know. If you still are unsure, remember that it is always better to be overdressed than underdressed. Using sites like LinkedIn, Facebook, Twitter, etc. can strengthen your connection with future employers and improve visibility. This can include “Liking” or sharing relevant industry news, following employers of interest, connecting with hiring managers, or updating your “About Me” section with previous work experience. However, if you are using social media, it is important to maintain a positive, professional image when you post. Always use a professional photo and make sure to never post anything that could be damaging to your professional reputation.